What?! You're regular party balloons don't illuminate? Then it's time to upgrade to these cool new iLLoom Balloons. 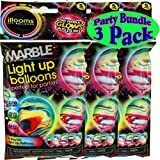 To use, use pull the tab to activate the light, inflate like normal, and enjoy a glowing balloon for up to 15 hours. 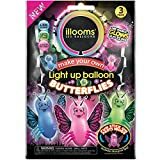 Great for birthdays, parties, weddings, or just fill them with helium and let them go to start a UFO scare. They come 15 to a pack in a variety of colors. Very cool.